It is a fact of life that every day, tens of thousands of people in the Raleigh/Durham area – all too many of them children — go to bed hungry. In our country, which is blessed with so much, this is a real tragedy and should never happen. The good news is that there’s something that we can do to help. Today I had the privilege of volunteering alongside 1,000 employees from Raleigh/Durham businesses for the 3rd Annual Sort-A-Rama. Sort-A-Rama, organized by the Food Bank of Central and Eastern North Carolina, brings together caring volunteers to sort and package 150,000 meals for the half million individuals facing hunger in our area. This was my second year participating, and I have to say, it was an incredible event. We even exceeded our goal of 150,000 meals and bagged a total of 176,000 for families in need. Now that’s a great feeling. This morning I located my assigned bin with five other RTP employees (a tote containing 2,000 lbs. of Long Grain Rice) and began filling – and we didn’t stop for three hours. We filled a labeled, clear, plastic bag with 3 scoops of rice, tied the bag to secure its contents, and placed it in our team’s bin. Our team was able to completely fill two bins of packaged meals during our shift – that’s a lot of meals! It was wonderful to see so many people from the RTP area come together to serve our community. The buzz of networking, music, and laughter filled the warehouse. Once we took our gloves off and cleaned up our station, we felt grateful to know that we had the opportunity to make even a small difference in the lives of our friends and neighbors. I am passionate about fighting hunger and am proud to be involved with the Food Bank of Central and Eastern North Carolina. Volunteering at the 3rd Annual Sort-A-Rama was a rewarding way to get involved and make a difference on September 11th – which has become a National Day of Service. In addition to volunteer shifts at my local branch, I am on Cisco’s Civic Council and serve as a lead representative for the Food Bank on behalf of Cisco. 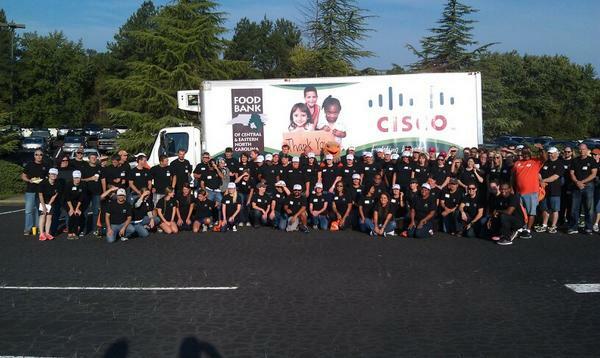 I am proud to rally my Cisco network, team members, and co-workers to attend Sort-A-Rama and other Food Bank volunteer events. On behalf of the 175 Cisco employees who volunteered at Sort-A-Rama, I would like to thank the Food Bank staff members, participating sponsors, wonderful employee volunteers from various RTP corporations, and everyone else who made this event possible and so much fun. Bravo! The Cisco team at Sort-A-Rama 2014.